We’d love your help. Let us know what’s wrong with this preview of Scent of Madness by Heather Long. Ryker continues to hunt for the elusive murderer. The others have eliminated several suspects, but tensions in the Black Hills have never been higher. For all of his experience in hunting and dealing with the wolves, Ryker has never found himself torn between two loves before—to be the killer he is, means he has to turn off the softer side Saja awoke in him. Saja’s life with the wolves is nothing she would ever have imagined. Being the center of Ryker’s attention is both a blessing and a curse, but her mate’s gentle, indulgent nature seems to be a thing of the past. While she understands his remoteness comes from a place where caring and fear collide, she doesn’t want to lose Ryker to the madness creeping through the pack. To ask other readers questions about Scent of Madness, please sign up. I was given an ARC by the author in exchange for an honest review. This has to be perhaps the best book in the series!!!!!!!!!!! Ryker continues to h I was given an ARC by the author in exchange for an honest review. Clashes with Colt and several other dominants heighten the danger, and Ryker refuses to allow her out of his sight unless she is with Gee. When the killer sets his sights on her, will the Enforcer drive his mate away rather than lose her? Everything is finally coming together! So intense,so dark,so powerful this book will keep your heart beating so freaking fast from the first page to the last! Fast paced with the anxiety building and the mystery going this book was creative and so well written! Then comes the tears....big fat tears streaming down your face cause simply you are unable to stop yourself from crying!!!! Playing between the paranormal and the psycological thriller the book ends this awesome subseries with a bang! The book focuses on the effords Ryker does to find the killer while Drew is still out of it. The internal as much as the external turmoil Ryker is going through is amazing. The insight we see from the killer till the point that the revelation of the killers identity is rollercoaster that left me with my jaw hanging! An amazing amazing amazing ending to the series and an awful good addition to the black Hills Seires!!!!! First, I have loved every single one of the Black Hills Wolves stories. Second, I'm not going to say anything about the actual story, as I don't want to accidentally give anything away. So, I am just going to say that not just this book, but all four of these books in this sub-series had me in their grips and impatiently waiting for the next book. That is a good thing! I love alpha males and as always, there are plenty in these stories. Plenty of laughing, loving, testosterone, heartache and the strong, intelligent, beautiful women that stand by their sides. These authors did a fantastic job of blending all their stories together. A few of these authors are among my favorite authors and others are still basically new-to-me authors (other then the books in the Black Hills Wolves series), but I hope to be able to change that someday and be able to read more of their books. I was given an ARC of this book in exchange for my honest opinion in a review. GOODNESS GRACIOUS ME! Have you ever read a story that you didn't want to end. Black Hills Wolves is that story. I don't know if the authors will stop writing stories for this series and I hope there are a lot more books in this series. I wish I could say I have read all of the books in this series but I haven't, but I intend too read them all. Because if they are like the last four books I read from the series then they are fantastic and I'm excited to read all of the books in this series. The storyline is very powerful, suspenseful and the most intense, it will keep you on the edge of your seat, I wanted to keep reading and get to the end at the same time. I was so fascinate and engage from the begining to the end! The storyline flows well and is fast paced with lots of suspense and there is a mystery to be solved. I have admired Ms Long writing, her creativity and I have been a fan of her's forever. The storyline is emotional, captivating and magnetic. The characters are fantastic, enchanting, powerful and charismatic. The scene description are superb, the dialogue is full of camaraderie, rage and romance. There is sadness and mayhem and if you are like me I needed a box of Kleenex because I couldn't stop the tears from falling. Saja’s life with Ryker and the wolves is everything she ever love. Being Ryker’s mate is both a blessing and a curse, but he is shutting her out, her mate’s gentle, indulgent nature seems to be on a fast train to the past. She try's to understand why he distance hisself from a place where caring and fear collide, but she won't lose Ryker to this madness. She will force him to include her love for him. The story is between a paranormal and mystery romance thriller and of course the book ends the mini subseries with FIREWORKS! There are internal and external turmoil throughout the story and it's SPECTACULAR! There are many twists, turns and surprises the killer identity being one. The characters are alive on the pages and Saja and Ryker chemistry sizzles. All though the stories Ryker is tough, dangerous, compassionate and loyal. Saja’s fierce's heart and love for Ryker and the pack makes her a MAGNIFICENT character. This is a amazing, compelling, awesome end to this 40th book in the series and an a great addition to the black Hills Seires! A most climactic read. If you love reading a shifter series with suspense, amazing characters, mystery then this is a series for your TBR list. I Highly Recommend this book and the series. If you believe in the world of paranormal romance, the possibilities are endless and fascinating! A fantastic conclusion to the gripping and edgy Murder in Los Lobos. Will the real Ryker please stand up? I absolutely loved it. OK, I admit it, I'm totally addicted and can't seem to get enough of the terrific multi-author Black Hills Wolves series which started the New Year with a gripping new subset. The fourth and final book in the cohesive 'Murder in Los Lobos' is 'Scent of Madness' by the equally terrific and addictive Heather Long. I was given a copy in exchange for an honest review and I really couldn't put it down. Well written in the third person this story brings a sense of frantic desperation to Ryker's on-going hunt for the killer as well as periods of light relief and some serious steam. Like the previous three books this story is as much psychological thriller as it is paranormal romance and I was totally immersed in the action from the very first page. It kept me on the edge of my seat and practically gnawing my finger nails down to my elbows as the tension kept building right up to the revelations of the last chapter. Despite some seriously gorey visuals as some of the missing bodies are found, the conclusion to this murder mystery had the feel-good factor leaving me with a smile on my face and a sense that all is right in the world of the Tao Pack. At least for now. I absolutely loved it. The killer is murdering human true mates and the wolves they're mated to and this finale centres on Ryker, the pack Enforcer and his human true mate, Saja and is set a few weeks after the Solstice celebrations when the couple have already been happily mated for a year. It's difficult to say much about the substance of the story without giving spoilers and ruining the fear and tension filled atmosphere created by the story so far and which the author has carefully built on and maintained right up to the point the killer is caught. There have been clues to Ryker's true nature in the previous books I've read and I've always liked the character, firmly believing there was more to him than the impression he gives to the rest of the pack of a stone cold killer. You can almost feel Ryker's emotions as he changes his approach and starts to think in terms of what the killer might have thought and done, following a path left by the changing scent of the one he's hunting. You can also feel his terror when he realises that his beloved Saja is the killer's next target and his panic and frustration when his smart and feisty mate not only refuses to do what he wants, but gives him a new perspective on what the killer is really doing. But why he's doing it is something you'll have to read the book to find out. It'll be worth it, but you'll need a few tissues. There are happily ever afters all around in this book and I'm both relieved and happy about that. The pack will never be the same, but not for the obvious reasons. I highly recommend this book, subset and entire series to anyone who likes substance with their steamy paranormal romance. 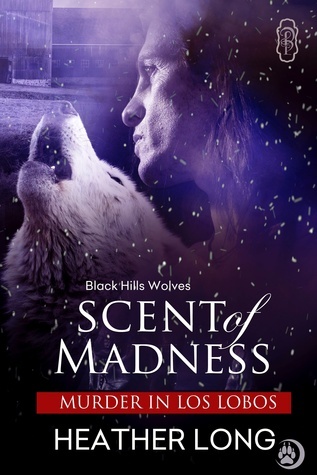 SCENT OF MADNESS-BLACK HILLS WOLVES (MURDER IN LOS LOBOS)-AN ENTHRALLING SUSPENSEFUL ROMANTIC STORY. This story focuses on; RYKER, heart-stirring handsome powerful wolf-shifter and Enforcer of the Black Hills Wolves; SAJA, a sultry, intelligent beautiful human and Ryker’s mate. What you’ll find in this story; a cast of remarkably impressive and engaging characters, fantastic story-line, powerful vivid scene descriptions, superb banter, camaraderie, gripping suspense, emotions spiral, heart-rending SCENT OF MADNESS-BLACK HILLS WOLVES (MURDER IN LOS LOBOS)-AN ENTHRALLING SUSPENSEFUL ROMANTIC STORY. What you’ll find in this story; a cast of remarkably impressive and engaging characters, fantastic story-line, powerful vivid scene descriptions, superb banter, camaraderie, gripping suspense, emotions spiral, heart-rending moments, pent-up rage, odious crimes, life threatening incidents, surprises for Ryker, earth-shattering jaw-dropping toe-curling romance, and a melt your heart conclusion leaving you wanting more. The killer continues to elude Ryker and the other wolves tracking him. Another devastating crime has been committed. Ryker wants to send his mate away to protect her, but she refuses to leave his side. Ryker is beside himself lacking sleep and enforcing that no one wander the territory. To make matters worse Colt's hot-temper has him attacking Ryker. When Saja goes missing, Ryker's pent-up rage washes over him, fueling him with the power to hunt; hoping he is not too late to save his mate from the evil clutches of the psychopath killer.. Murder in Los Lobos. Yes I'm speechless what can I say but Yes I triple recommend this book, these books, they are not only phenomenal, but fantastic too. Lots of things are happening Ryker is going crazy trying to find the killer already to many have died with not one clue. He needs to protect his stubborn mate. But in order to find the killer someone else has to protect Saha and Ryker only trusted Drew and Gee. Alpha Drew is still in a coma, what are they going to do if he doesn't wake up? I was gifted this ARC for an honest and truthful review. Scent of Madness is the amazing finale to the four book series with in a series. Scent of Murder by Cara Carnes, Scent of the by Cam Cassidy, Scent of His Woman by Rebecca Royce and Scent of Madness by Heather Long. They can technically be read standalone but are really each a part of a whole story arc. In Scent of Madness we find out who is killing the human mates and why. We also get to take a peek into Ryker and Saja’s life. Ryker has been doing the best he can under trying circumstances as h Scent of Madness is the amazing finale to the four book series with in a series. Scent of Murder by Cara Carnes, Scent of the by Cam Cassidy, Scent of His Woman by Rebecca Royce and Scent of Madness by Heather Long. They can technically be read standalone but are really each a part of a whole story arc. In Scent of Madness we find out who is killing the human mates and why. We also get to take a peek into Ryker and Saja’s life. Ryker has been doing the best he can under trying circumstances as he has always done. And despite being a hardass I can’t say I found a wolf I admire more. This is a heart wrenching tale that will leave you with hope and a smile. Ryker is going a little nuts trying to hunt down the killer. The guy always seems a few steeps ahead of him. Now he is after his mate! The ending is awesome and tells all so don't worry lol. I got to say the action and mystery in these book along with the spice is perfect. Can't wait to read more of the black hill wolves! Book gifted for an honest review and I honestly loved it.